Info "Bring the land back to life by working it with your hoe! Who knows what treasures the earth holds!" Soiled Reputation is one of Dribble and Spitz's Microgames in WarioWare: Smooth Moves. The objective is to hoe the land by holding the Wii Remote upright and then moving it forward. 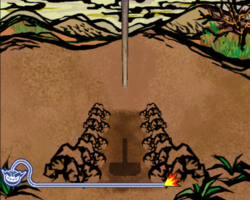 1st level difficulty: The player has to hoe the soil once. When the level is beaten, butterflies get out of the soil. 2nd level difficulty: The player has to hoe the soil twice. When the level is beaten, a tree grows up and many peaches fall on the ground. 3rd level difficulty: The player has to hoe the soil thrice. When the level is beaten, a dinosaur skeleton get out of the soil and roars. This page was last edited on February 20, 2018, at 15:37.